Synergy Telecom Pvt Ltd is a leading provider and manufacturer of Telecom Equipment, Antennae, Cable assemblies, Microwave Components, IBS and BTS installation materials, Solar passive components and solutions. We maintain a large inventory of fast moving material like Cable, Cable Assemblies, Connectors, Passive RF components and Installation Material. We are approved vendors with BEL, ITI, DRDO, RAILWAYS, ISRO, Private Telecom Operators, BSNL. We believe in creating value for our customers by continuous improvement of products, service quality and customer satisfaction. RF Cables: LMR 100/200/400/240/300/400; RG6/11/58/59/142/174/178/179/188/213/214/217/223/316/400, 1.13 mm etc. as also High Frequency Cables Suco 141/0.86/RG402/ 405/ SS402/ 405/ LL120/ 142/335 etc. RF Connectors: N, DIN, BNC, SMA, TNC, MCX, MMCX, SMB, SMC, SSMA, SMZ, 1.6/5.6, 1.0/2.3, FME, UHF, RCA as also High Frequency Connectors 2.4mm/2.92mm/1.95mm/3.5mm/N/ SMA/ DIN/ APC7 etc. RF Adaptors: N/L9/SMA/SMB/BNC/TNC/SMZ/MCX/DIN in various combinations of Male and Female including High Frequency adaptors 2.4/2.92/3.5mm etc. RF Cable Assemblies & Jumpers: All kind of cable assemblies and jumpers including Precision High frequency Cable assemblies with customized combination of cable type, length and connectors with a fast turnaround time for custom cable assemblies. Waveguide Products: Straight, Bend, Twist, flexible, elliptical waveguides and waveguide parts like Tee, Transitions, Loads, Couplers, Isolators, Joints, Shorts etc. Telecom Equipment: Complete range of telecom access equipment that include Wireless Home Gateways, Portable Hot Spot, M2M modules and solutions, Indoor and Outdoor Routers based on GSM, WCDMA and LTE Technologies. Electronic Instruments: High end test equipment like LOW PIM Testers, Communication Test Sets for 2G/3G/4G. Tools: Complete range of tools, tool kits, and electronic instruments like Multi-meters etc. from reputed Taiwan Company. 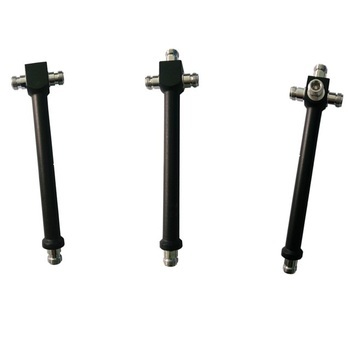 Solar: Solar connectors(MC4, MC4 branch, diode connectors, fuse connectors, tools including crimping tools including hydraulic, wrench, cutting tools), DC and AC solar UV protected cables and cable assemblies. Optical: All optical fibers, connectors and their patch chords, pigtails, attenuators, FDMS.